Thanks to a strong job market and a high number of people flocking to it – competition for top jobs and top pay are steeper than ever. When your resume is too long, it buries the important facts, increases the odds it’ll get skimmed, and makes it harder for the hiring manager to figure out if you’re a good fit to interview. For most people, three pages is way too long. Unless you’re an academic researcher or have 25 years of experience, you should make it shorter. One page is great when you’re new to the workforce or have been in a similar role throughout most of your career. For everyone else, a two-page resume is ideal. Font: Choose small sans serif font (Calibri or Ariel) with a 10- or 11-point size. Make sure your resume doesn’t set off any alarms that it is dated. With an outdated resume, you run the risk of being perceived as out of date yourself. So make use of white space on your resume. Make it inviting and easy to read. Whenever something is hard to read, there’s a greater chance the person reading will just skip it. Avoid 5-line paragraphs, or more a long list of bullet points crunched together without any spacing. Whittle your sentences or bullets down to no longer than 3 lines (1 to 2 lines is ideal). Insert at least a .5 point of white space between each bullet and/or paragraph to make it less overwhelming to read. The first thing journalists learn is to never bury the “lead”. When it comes to resumes, you should never bury your achievements below a job overview or list of responsibilities. First-round readers are often too busy to get past the first couple of lines of each employment entry – which means if your biggest achievements aren’t the first thing they see they may never get to it! Ask yourself what you are proudest of with each role, and lead off with this response. Weave in some data or figures to back it up and you are sure to impress – or at least compel the reader to take a deeper look during Round Two. Get Your Resume in the Keep Pile! 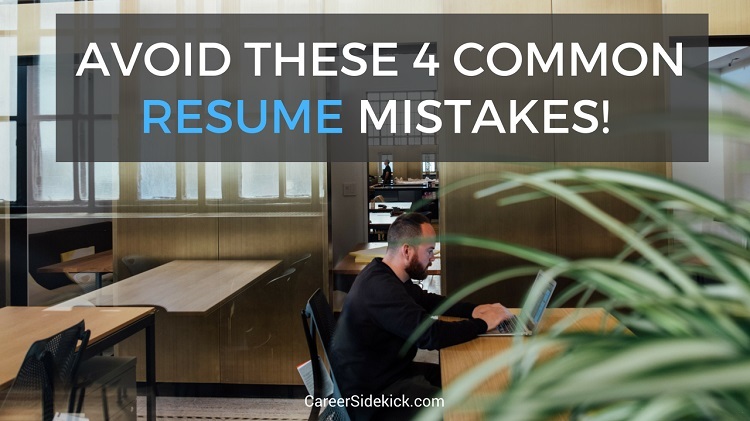 Correcting these 4 resume mistakes will go a long way toward keeping your resume out of the trash and into the “keep” pile. If you’re not getting as many interviews as you’d like, this should help you turn it around!